We continuously work to improve our operating performance, with an emphasis on health, safety and environment, asset performance and operating costs. Asset sales are a key element of our strategy – improving our capital efficiency by focusing investment on the most attractive growth opportunities. Sales of non-core assets in 2010–2012 generated about $21 billion in divestment proceeds. Exits from further positions in 2013 are expected to generate up to $3 billion in divestment proceeds. In early 2012, we set out a new growth agenda. For the period from 2012–2015, we aim to deliver cash flow from operations (CFFO) totalling $175-200 billion excluding working capital movements. This is about 30-50% higher compared with the 2008–2011 period. This target assumes that the Brent oil price is in the $80-100 per barrel range, and that North American natural gas prices and downstream margins will be higher than in 2012. The increased cash flow would finance an expected net capital investment programme of $120-130 billion for 2012–2015, an increase of about 10-20% compared with the 2008–2011 level, and fund competitive dividends for shareholders. Shell is on track to deliver these targets. Shell’s strategy in Upstream is designed to drive financial growth, with production growth regarded as a proxy for this over the long term. We have the potential to reach an average production of some 4.0 million boe/d in 2017–2018, compared with 3.3 million boe/d in 2012. This will be driven by the timing of investment decisions and the near-term macroeconomic outlook. In Downstream we evaluate selective growth opportunities in chemicals, biofuels and growth markets. 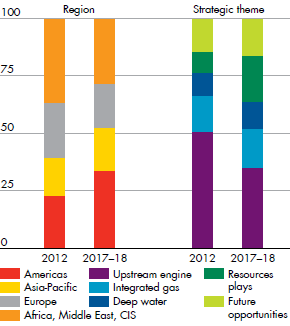 Shell has built up a substantial portfolio of options for a next wave of growth. This portfolio has been designed to capture energy price upside and manage Shell’s exposure to industry challenges from cost inflation and political risk. Key elements of this opportunity set are in global exploration and established resource positions in the Gulf of Mexico, North American resources plays and Australian LNG. These projects help ensure that the portfolio has the potential to underpin production growth to the end of this decade. 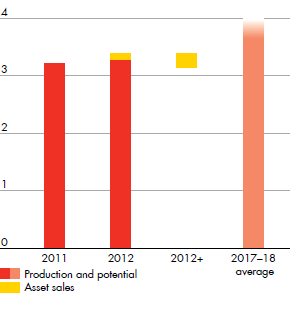 Shell is working to mature these projects, with an emphasis on financial returns. The statements in this Strategy and outlook section do not take into account the impact of the agreement to acquire part of Repsol S.A.’s LNG portfolio, which was announced in February 2013. The statements in this Strategy and outlook section, including those related to our growth strategies and our expected or potential future cash flow from operations, net capital investment and production, are based on management’s current expectations and certain material assumptions and, accordingly, involve risk and uncertainties that could cause actual results, performance and outcomes to differ materially from those expressed herein. 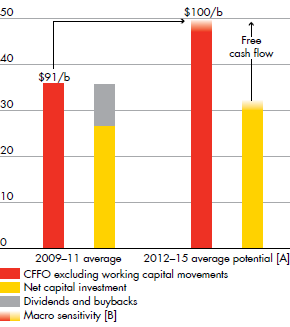 CFFO outlook at $100/b Brent, assumes improved US gas environment from 2012; CFFO excludes working capital movements. CFFO and capex outlook at $100/b Brent, assumes improved US gas, WTI and downstream environment from 2012; CFFO excludes working capital movements. Potential impact in $100/b Brent scenario from continuation of 2012 downstream environment, Henry Hub, WCS and WTI discounts. Outlook at $80/b Brent, assumes improved US gas prices from 2012 and 250 kboe/d divestments and lease expiries 2012+.